Below are the rules of running an AWPA Whipcracking Championship Event. If a member is running a state championship the common AWPA rules must be followed if they wish to have the AWPA promote and support the event. See here for other rules and regulations. Download our constitution here. To be eligible to compete at the 2019 Australian Whipcracking Championships a competitor must have competed in an AWPA state title after the 2018 Australian Championship but before the 2019 Australian Championship. World Bullock Whip Title is exempt from this rule. Dress : Suitable ‘Australian – type costume’ including a hat and boots, should be worn. Neat and tidy appearance is suggested. Sneakers, base ball caps, thongs, tee-shirts and other inappropriate clothing will result in the deduction of points in presentation. Whips : Whips other than Australian Stockwhips made of leather will not be allowed. All whips must be safe to use and should be presented in a well maintained condition. Manners : Competitors should acknowledge the judges before and after their performance and at all times conduct themselves in a sporting way. Points may be deducted from presentation score for failing to acknowledge the judges. Competitors in each event under progression must wait in a designated area while that competition is taking place. Conduct : Any competitor heard swearing while competing will be disqualified immediately. Alcohol/Drugs/Smoking : No competitor, official, judge or compare is to be under the influence of alcohol, smokes, or drugs during the competition or while representing the AWPA. No second person or animal may be used by a competitor during the competition in any section. Code of Ethics should be adhered to for all approved competitions, exhibitions, and demonstrations, not just AWPA Championship events. Common AWPA Whipcracking Rules - Championship Events. Presentation : Up to 10 points can be awarded by each judge for overall appearance, appropriate dress, presentation of whips, performance and confidence. Equipment : Entrants may only use Australian Stockwhips comprising a handle, thong, and fall joined by a keeper. The whip must be plaited from leather. If the judges deem a whip is not in safe working order, the competitor will be asked to use a replacement whip. A Bullock Whip may be used in the Pee Wee division for one crack/routine. A cattleman's crack only must be used to cut the target on the down stroke. A competitor must not cross or touch the toe line at anytime once the first crack at a target has been made. A competitor must not touch a cup that has been cut from the stand or interfere when the judges are making their decision on points to be awarded. Points awarded will be 1 for a slice, 2 for a clean cut through middle. 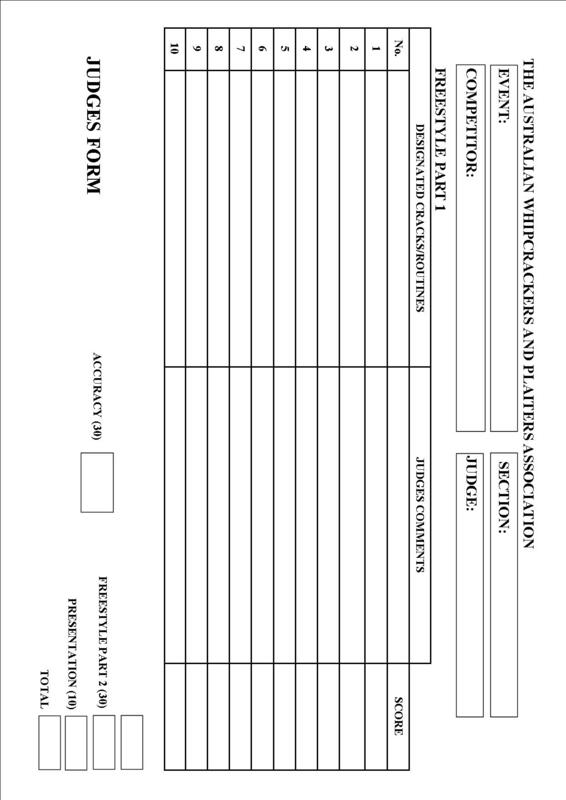 For your info download the accuracy judges form. Judging Freestyle Section-Part 1 : A minimum of 2 Judges must be used. Each competitor will be required to fill out a carbon copy judges form and Competitor Profile Sheet on the day of the competition. On the judges form the competitor will fill out his/her designated cracks/routines. Competitors are encouraged to come up with there own original routines. Each routine/crack will be read out by the MC before the competitor completes the routine/crack. The AWPA whipcracking guide can be used as a reference for judges and competitors. A routine could be awarded from 1 up to 25points depending on the difficulty, it is up to the judges discretion. A "Cattleman's Crack" and "Fast Figure 8's" would be at the bottom of the scale, above would come rhythm cracking, then crossovers such as "QLD Crossover", then routines such as the "Staggered Double Four Corners" at the top end of the scale. A competitor will not score as high if tangles, quite cracking or missed cracks are made. Judging Freestyle Section-Part 2 :After all the routines/cracks have been completed the "Competitor Profile Sheet" will be read out by the MC giving a short rest to the competitor before completing there 30second or 1minute continuous routine/cracking depending on which section the competitor is competing in. Up to 30points can be awarded in this section from each judge. Protests : After the scores have been released at the end of the event the individual competitor has 5 minutes to lodge official protest with event secretary or nominated person accompanied by a fee of $50. Judge's decision will then be final. Freestyle Sections (Not all sections may be held): (Novice-Any age), (Pee Wee, 8years and Under), (Juvenile's 12years and Under), (Junior's 16years and Under), (Ladies), (Men's), (Over 45's), and (Bullock Whip). Ages are as of the day of competition. Pee Wees are required to complete up to 10 designated routines/cracks and a 30second freestyle routine. See this list for easiest way to get 10 different cracks. A competitor should be able to reach the level in the list after 3-5hrs practice. Juniors, Ladies' and Men are required to participate in the accuracy component, complete 10 designated routines/cracks and a 1 minute routine. Over 45years are required to participate in the accuracy component, complete 5 designated routines/cracks, and a 1 minute routine. Over 45 year competitors can choose to compete in either the Men's/Ladies division or the Over 45's. AWPA BULLOCK WHIP Whipcracking Rules. Entrants will be required to complete a 1 to 2 minute (judges discretion) routine with a bullock whip and will be given a score of the judge/s discretion. The bullock whip should measure a minimum of 7 1/2 ft in the thong and 5ft in the handle. This section is open to any age. Dress rules apply. All members are covered in competitions only. If you are performing, or teaching you will need to pay $50.00 and fill out this form. Sponsors must be given the recognition that their level of sponsorship stipulates on the sponsorship page or there agreed terms. Below are the details of running non-AWPA common rule events. All non-championship events which are not National or State titles shall be conducted at the discretion of the individual/club hosting the event. These events could include country shows, promotion event, or non-championship competition and are not under the common AWPA Championship rules unless the organizer chooses to. Please Note* Promotion events may not cover individuals under the current AWPA insurance policy. AWPA Code of Ethics upheld. All members who are demonstrating or performing are expected to uphold the values of the AWPA. Members who are seen to be misrepresenting our association could lose membership if all committee members agree. Dress : Suitable ‘Australian – type costume’ including a hat and boots should be worn. You are after all....representing our association and our country. Conduct : Members are expected to present themselves in a professional manner with no crude or rough language. Don't be a show pony....but demonstrate whipcracking and our culture......not how good you are. Alcohol/Drugs : No performer is to be under the influence of drugs or alcohol.